Sargassum Seaweed has invaded the beach at the Grand Turk cruise center which is popular with cruise ship passengers. One thing which cruise visitors aren’t expecting right now during a port of call in Grand Turk is the dark gloomy seaweed which is just taking over the stunning beach. Cruise ship passengers who are visiting Grand Turk in the Turks and Caicos these days are not being met with those stunning blue tropical waters they expected. At the moment a dark reddish seaweed called Sargassum can be seen dominating the beach and water which is located just across from where the ships dock and next to the cruise center. Around three months ago the SunRay Beach was stunning but now the Sargassum Seaweed has invaded and can be seen covering the shallow waters and parts of the actual beach. 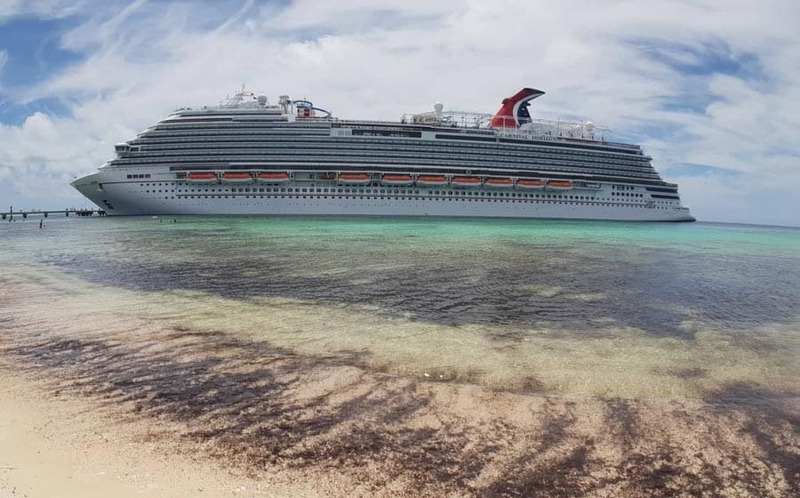 As you can see from when the Carnival Cruise Line operated ship was docked in Grand Turk most cruisers kept away from taking a dip in the water. They were likely spending some time exploring the port area too. This type of seaweed may not look so inviting but is harmless and can even be good for nature. However, it doesn’t have a good impact on the tourism industry and has also been an issue for other Caribbean cruise destinations too. You can take a look at the video which was posted by our friend at I Like Cruise Ships. It’s a walk around the beach and port area where you can really see how much of seaweed has taken over. The Turks and Caicos Government addressed the recent influx of Sargassum Seaweed taking of the shores. 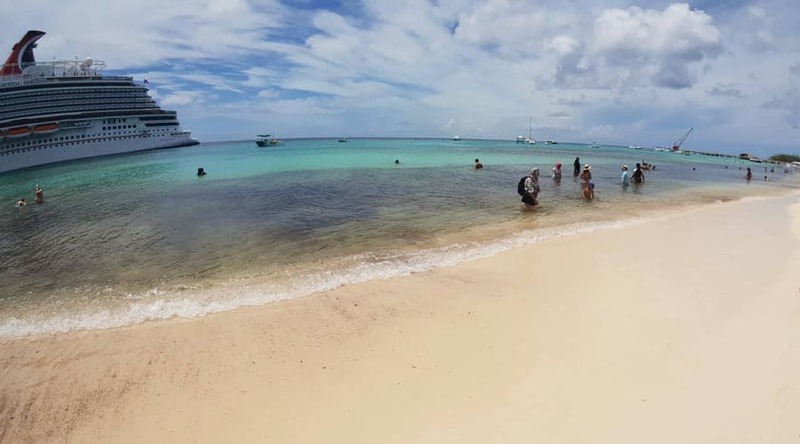 A plan is being put together with measures to tackle it, in a recent cabinet meeting held on August 29, the Minister of Tourism, Environment, Heritage, and Gaming submitted a progress report on the drafting of a Sargassum Policy. The government is not likely to send in heavy machine and diggers to remove the masses amount of Sargassum Seaweed so we’re expecting local business impacted by this to get their hands dirty and remove it using more traditional methods. This would keep the stunning beaches unharmed and left for the important tourists to enjoy. If you do have an upcoming cruise which includes a call in Grand Turk we hope you still manage to enjoy your experience and not let the seaweed take anything away from the stunning views.